They look like so many little pink balloons, long deflated, on short stalks. That's what struck me when I chanced upon a large glade in a jack pine forest, full of Pink Lady's Slippers (Cypripedium acaule), one of Manitoba's wild orchids. Wild orchids . . . ooh! Rare . . . obscure . . . exotic? Or common as dirt? Actually, it depends on which orchid you're talking about. Manitoba has lots of wild orchids, 38 species, give or take, plus a number of different varieties of certain species, and most of them are quite common. The rare ones get all the press, though. And there is this great mystique about orchids, in general, so people always seem to get worked up about them. Me? Heck, I like them. In fact, I'd go so far as to say they are some of the most spectacular wildflowers we have in Manitoba. I just don't get all googily about them . . . any more. A gorgeous Pink Lady's Slipper. There was a time when I had the same stereotypical view of our native orchids that is pretty common out there. You know, the "Oh my God, it's an orchid! Somebody better do something to protect this land!" attitude. While there are some species or orchids and special places out there that do merit our concern, it can be counter-productive to conservation efforts if people get too excited about wild orchids. Conservation should always be about preserving entire ecosystems and working to maintain the natural processes that sustain these ecosystems. Hands-off preservation of small sites isn't enough. The truth is, most orchids are pretty hardy plants, and all the orchids we have in Manitoba are well adapted to the rigors of our environment and the fluctuating nature of our ecosystems. And by that I mean the propensity for most of our ecosystems to experience major upheavals. Most orchids deal with them in stride. Prairies would regularly burn, get grazed flat and trompled by bison; they would get flooded out in some years, then parched in droughts. Forests would burn and grow again. Wetlands would fill up and become lakes in times of flood, then end up as prairies in dry times. Tremendous variation is the norm for Manitoba's ecosystems. This isn't the tropical rain forest, where the weather and conditions stay constant and the plant communities have existed untouched for millennia (until the last few hundred years). Manitoba's landscapes have always been as changeable as our weather. And the plants and animals that call this province home have adapted to, and often require, changes and disruption in order to flourish. Our wild orchids are a case in point. Most of them are good early-invaders; that is, they are colonizers of disturbed soil or burned ground. Their real enemy, aside from people destroying their habitat completely, is often ecological succession: the changes that come with time, as plant communities "mature". Forest canopies close in, prairie grasses choke out competing species, trees and shrubs invade open prairies, and so on. All our orchids are low growing, herbaceous plants. Tall grasses, shrubs and trees cast shade on the ground and the plants struggling to make a living below them. Individual orchids may live for many years, quite often having germinated and started life in conditions far different from those we later find them in. A dappled forest glade, dotted with lady's slippers, may have been burned, blackened earth 30 years before. At some point in forest succession the orchids moved in to colonize the site, or survived the fire below ground. They flourish now, but in another decade or two, the forest canopy will shut out the life-giving sun, and the orchids will disappear; only to return again after fire sweeps the land clean again. In the short span of human existence we tend to be witness to only one small part of nature's plan. We see one still frame of the full-length movie that is life on earth. I remember going to a wedding once, in the country, up near Grand Marais. This was back in my naive days. I walked into the tiny church and was horrified to see dozens of bunches of lady slippers, both the Pink (C. acaule) and Yellow (C. parviflorum) species, in vases lining the sills of all the windows. I'm sure everyone else thought they were beautiful, but I was aghast. How could anyone defile so many of these precious plants? I spent most of the ceremony staring, appalled, at the macabre displays; to me, like the heads of so many innocents displayed on stakes along the walls of some medieval castle. Of course, it didn't dawn on me until years later that the reason they had managed to collect so many lady's slippers was that, aside from it being the right time of year to find them, the countryside up there was absolutely filthy with them! It would have been like picking dandelions in Winnipeg! They were a very common wildflower that the locals thought nothing of picking. In my urban solitude, where such plants are often rare or non-existent, I'd grown up thinking that orchids were to be treasured and protected. (It's the old "city-people vs. country-folk" thing.) They use them, but they don't abuse them. They just cut the flowers, they don't dig them up and scurry back to their urban gardens with them (Yes, that's a "dig" at the attitude of all too many city gardeners! ), and they leave most of the land where they grow untouched. Though, that's mainly through necessity rather than by plan; it's much too sandy up that way for agriculture. Actually, that raises a pretty important issue about conservation in Manitoba. About 60% of Manitobans live in Winnipeg, and probably 80% or better of us now live in cities or towns, apart from the country and the natural habitats of this province, a clear democratic majority of urbanites with the political power to greatly influence both the lives of rural people and the natural areas they live in and near. You've heard about walking a mile or two in someone else's shoes? Perhaps more of us city-types should spend a little time on the land before we judge our rural cousins about how they treat the land and our natural areas. But, I digress. 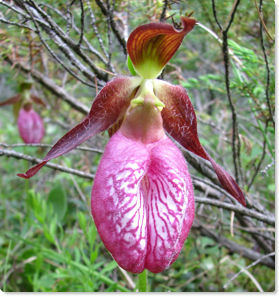 Back to the main topic: wild orchids, or more precisely, one wild orchid, the Pink Lady's Slipper. The Pink Lady's Slipper, or moccasin flower as it's also known, is one of my favourites. The large pink flowers often seem to rise mysteriously from the near barren floor beneath a canopy of jack pines, or in a small glade surrounded by spruce or fir trees. Blooming in late June and into July, they are a harbinger of the coming warmth of summer. But, like the season they foretell, they too, seem to come and go all too quickly. So, this year, try and get out to see them before they're gone.